This article is about current German state and its historic antecedents. For the Prussian province (1868–1945), see Province of Schleswig-Holstein. For the warship, see SMS Schleswig-Holstein. Schleswig-Holstein's islands, beaches, and cities are popular tourist attractions (here: Isle of Sylt). The term "Holstein" derives from Old Saxon Holseta Land, (Holz and Holt mean wood in modern Standardised German and in literary English, respectively). Originally, it referred to the central of the three Saxon tribes north of the River Elbe: Tedmarsgoi (Dithmarschen), Holstein and Sturmarii (Stormarn). The area of the tribe of the Holsts was between the Stör River and Hamburg, and after Christianization, their main church was in Schenefeld. Saxon Holstein became a part of the Holy Roman Empire after Charlemagne's Saxon campaigns in the late eighth century. Since 811, the northern frontier of Holstein (and thus the Empire) was marked by the River Eider. The term Schleswig comes from the city of Schleswig. The name derives from the Schlei inlet in the east and vik meaning inlet in Old Norse or settlement in Old Saxon, and linguistically identical (cognate) with the "-wick" or "-wich" element in place-names in Britain. 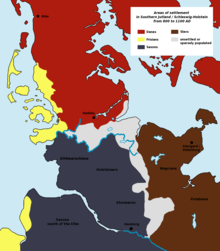 The Duchy of Schleswig or Southern Jutland was originally an integral part of Denmark, but was in medieval times established as a fief under the Kingdom of Denmark, with the same relation to the Danish Crown as for example Brandenburg or Bavaria vis-à-vis the Holy Roman Emperor. Around 1100, the Duke of Saxony gave Holstein, as it was his own country, to Count Adolf I of Schauenburg. Schleswig and Holstein have at different times belonged in part or completely to either Denmark or Germany, or have been virtually independent of both nations. The exception is that Schleswig had never been part of Germany until the Second Schleswig War in 1864. For many centuries, the King of Denmark was both a Danish Duke of Schleswig and a German Duke of Holstein. Essentially, Schleswig was either integrated into Denmark or was a Danish fief, and Holstein was a German fief and once a sovereign state long ago. Both were for several centuries ruled by the kings of Denmark. In 1721, all of Schleswig was united as a single duchy under the king of Denmark, and the great powers of Europe confirmed in an international treaty that all future kings of Denmark should automatically become dukes of Schleswig, and consequently Schleswig would always follow the same order of succession as the one chosen in the Kingdom of Denmark. In the church, following the reformation, German was used in the southern part of Schleswig and Danish in the northern part. This would later prove decisive for shaping national sentiments in the population, as well as after 1814 when mandatory school education was introduced. The administration of both duchies was conducted in German, despite the fact that they were governed from Copenhagen (from 1523 by the German Chancellery which was in 1806 renamed Schleswig-Holstein Chancellery). The German national awakening that followed the Napoleonic Wars gave rise to a strong popular movement in Holstein and Southern Schleswig for unification with a new Prussian-dominated Germany. This development was paralleled by an equally strong Danish national awakening in Denmark and Northern Schleswig. This movement called for the complete reintegration of Schleswig into the Kingdom of Denmark and demanded an end to discrimination against Danes in Schleswig. The ensuing conflict is sometimes called the Schleswig-Holstein Question. In 1848, King Frederick VII of Denmark declared that he would grant Denmark a liberal constitution and the immediate goal for the Danish national movement was to ensure that this constitution would give rights to all Danes, i.e. not only to those in the Kingdom of Denmark, but also to Danes (and Germans) living in Schleswig. Furthermore, they demanded protection for the Danish language in Schleswig (the dominant language in almost a quarter of Schleswig had changed from Danish to German since the beginning of the 19th century). A liberal constitution for Holstein was not seriously considered in Copenhagen, since it was well known that the political élite of Holstein were more conservative than Copenhagen's. Representatives of German-minded Schleswig-Holsteiners demanded that Schleswig and Holstein be unified and allowed its own constitution and that Schleswig join Holstein as a member of the German Confederation. These demands were rejected by the Danish government in 1848, and the Germans of Holstein and southern Schleswig rebelled. This began the First Schleswig War (1848–51), which ended in a Danish victory at Idstedt. In 1863, conflict broke out again when Frederick VII died without legitimate issue. According to the order of succession of Denmark and Schleswig, the crowns of both Denmark and Schleswig would pass to Duke Christian of Glücksburg, who became Christian IX. The transmission of the duchy of Holstein to the head of the (German-oriented) branch of the Danish royal family, the House of Augustenborg, was more controversial. The separation of the two duchies was challenged by the Augustenborg heir, who claimed, as in 1848, to be rightful heir of both Schleswig and Holstein. The promulgation of a common constitution for Denmark and Schleswig in November 1863 prompted Otto von Bismarck to intervene and Prussia and Austria declared war on Denmark. This was the Second War of Schleswig, which ended in Danish defeat. British attempts to mediate in the London Conference of 1864 failed, and Denmark lost Schleswig (Northern and Southern Schleswig), Holstein, and Lauenburg to Prussia and Austria. Contrary to the hopes of German Schleswig-Holsteiners, the area did not gain its independence, but was annexed as a province of Prussia in 1867. Also following the Austro-Prussian War in 1866, section five of the Peace of Prague stipulated that the people of Northern Schleswig would be consulted in a referendum on whether to remain under Prussian rule or return to Danish rule. This condition, however, was never fulfilled by Prussia. During the decades of Prussian rule within the German Empire, authorities attempted a Germanisation policy in the northern part of Schleswig, which remained predominantly Danish. The period also meant increased industrialisation of Schleswig-Holstein and the use of Kiel and Flensburg as important Imperial German Navy locations. The northernmost part and west coast of the province saw a wave of emigration to America, while some Danes of North Schleswig emigrated to Denmark. Following the defeat of Germany in World War I, the Allied powers arranged a plebiscite in northern and central Schleswig. The plebiscite was conducted under the auspices of an international commission which designated two voting zones to cover the northern and south-central parts of Schleswig. Steps were taken to also create a third zone covering a southern area, but zone III was cancelled again and never voted, as the Danish government asked the commission not to expand the plebiscite to this area. In zone I covering Northern Schleswig (10 February 1920), 75% voted for reunification with Denmark and 25% voted for Germany. 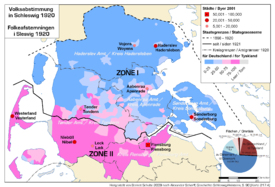 In zone II covering central Schleswig (14 March 1920), the results were reversed; 80% voted for Germany and just 20% for Denmark. Only minor areas on the island of Föhr showed a Danish majority, and the rest of the Danish vote was primarily in the town of Flensburg. In 1937, the Nazis passed the so-called Greater Hamburg Act (Groß-Hamburg-Gesetz), where the nearby Free and Hanseatic City of Hamburg was expanded, to encompass towns that had formally belonged to the Prussian province of Schleswig-Holstein. To compensate Prussia for these losses (and partly because Hitler had a personal dislike for Lübeck), the 711-year-long independence of the Hansestadt Lübeck came to an end, and almost all its territory was incorporated into Schleswig-Holstein. After World War II, the Prussian province Schleswig-Holstein came under British occupation. On 23 August 1946, the military government abolished the province and reconstituted it as a separate Land. Because of the forced migrations of Germans in 1944 to 1950, the population of Schleswig-Holstein increased by 33% (860,000 people). A pro-Danish political movement arose in Schleswig, with transfer of the area to Denmark as an ultimate goal. This was supported neither by the British occupation administration nor the Danish government. In 1955, the German and Danish governments issued the Bonn-Copenhagen Declarations confirming the rights of the ethnic minorities on both sides of the border. Conditions between the nationalities have since been stable and generally respectful. Schleswig-Holstein lies on the base of Jutland Peninsula between the North Sea and the Baltic Sea. 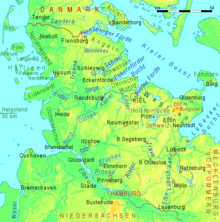 Strictly speaking, "Schleswig" refers to the German Southern Schleswig (German: Südschleswig or Landesteil Schleswig, Danish: Sydslesvig), whereas Northern Schleswig is in Denmark (South Jutland County, Region of Southern Denmark). The state of Schleswig-Holstein further consists of Holstein, as well as Lauenburg and the formerly independent city of Lübeck. Schleswig-Holstein borders Denmark (Southern Denmark) to the north, the North Sea to the west, the Baltic Sea to the east, and the German states of Lower Saxony, Hamburg, and Mecklenburg-Vorpommern to the south. In the western part of the state, the lowlands have virtually no hills. The North Frisian Islands, as well as almost all of Schleswig-Holstein's North Sea coast, form the Schleswig-Holstein Wadden Sea National Park (Nationalpark Schleswig-Holsteinisches Wattenmeer) which is the largest national park in Central Europe. Germany's only high-sea island, Heligoland, is situated in the North Sea. The Baltic Sea coast in the east of Schleswig-Holstein is marked by bays, fjords, and cliff lines. Rolling hills (the highest elevation is the Bungsberg at 168 metres or 551 feet) and many lakes are found, especially in the eastern part of Holstein called the Holstein Switzerland and the former Duchy of Lauenburg (Herzogtum Lauenburg). Fehmarn is the only island off the eastern coast. The longest river besides the Elbe is the Eider; the most important waterway is the Kiel Canal which connects the North Sea and Baltic Sea. Schleswig-Holstein has an aging population. Since 1972 the natural increases have been negative. In 2016 the total fertility rate reached 1.61, highest value in 40 years (the average value being 1.4). In 2016 there were 25,420 births and 33,879 deaths, resulting in a natural decrease of -8,459. The region has been strongly Protestant since the time of the Protestant Reformation. Percentage-wise it is the most Protestant of the 16 modern states. In 2016, members of the Evangelical Church in Germany make up 46.5% of the population, while members of the Catholic Church comprise 5.9%. 47.6% of the population is not religious or adherent of other religions. Schleswig-Holstein combines Danish and German aspects of culture. The castles and manors in the countryside are the best example for this tradition; some dishes like Rødgrød (German: Rote Grütze, literal English "red grits" or "red groats") are also shared, as well as surnames such as Hansen. The most important festivals are the Kiel Week, Schleswig-Holstein Musik Festival, an annual classic music festival all over the state, and the Lübeck Nordic Film Days, an annual film festival for movies from Scandinavian countries, held in Lübeck. The state's most important museum of cultural history is in Gottorf Castle in Schleswig. The Wagnerian tenor Klaus Florian Vogt is from Schleswig - Holstein. The anthem from 1844 is called "Wanke nicht, mein Vaterland" ("Don't falter, my fatherland"), but it is usually referred to with its first line "Schleswig-Holstein meerumschlungen" (i.e., "Schleswig-Holstein embraced by the seas") or "Schleswig-Holstein-Lied" (Schleswig-Holstein song). The old city of Lübeck is a UNESCO World Heritage Site. Danish, German, Low German and North Frisian are the official languages of the state. Low German is still used in many parts of the state, a pidgin of Low and standardised German (Missingsch) is used in most areas, and a pidgin of German and Danish (Petuh) is used in the Flensburg-Area. Danish is used by the Danish minority in Southern Schleswig, and North Frisian is spoken by the North Frisians of the North Sea Coast and the Northern Frisian Islands in Southern Schleswig. The North Frisian dialect called Heligolandic (Halunder) is spoken on the island of Heligoland. Schleswig-Holstein is a leader in the country's growing renewable energy industry. In 2014, Schleswig-Holstein became the first German state to cover 100% of its electric power demand with renewable energy sources (chiefly wind, solar, and biomass). The unemployment rate stood at 5.0% in October 2018 and was marginally higher than the German average. Compulsory education starts for children who are six years old on 30 June. All children attend a "Grundschule", which is Germany's equivalent to primary school, for the first 4 years and then move on to a secondary school. In Schleswig-Holstein there are "Gemeinschaftsschulen", which is a new type of comprehensive school. The regional schools, which go by the German name "Regionalschule" have been done away with as of 1 January 2014. The option of a Gymnasium is still available. There are three universities in Kiel, Lübeck and Flensburg. Also, there are four public Universities of Applied Sciences in Flensburg, Heide, Kiel, and Lübeck. There is the Conservatory in Lübeck and the Muthesius Academy of Fine Arts in Kiel. There are also three private institutions of higher learning. Schleswig-Holstein has its own parliament and government which are located in the state capital Kiel. The Minister-President of Schleswig-Holstein is elected by the Landtag of Schleswig-Holstein. The most recent Schleswig-Holstein state elections were held on 7 May 2017. The governing parties consisting of the Social Democrats, the Green Party, and the South Schleswig Voters' Association lost their majority. ^ By the federal vehicle registration reform of 1 July 1956 distinct prefixes were given for every district. ^ "Regional GDP per capita in the EU28 in 2013". Retrieved 10 September 2015. ^ Nygaard, Jørgen (14 May 2015). "Dansk er blevet officielt sprog i Slesvig". tvsyd.dk (in Danish). ^ Bock, Karl N. (1948). Mittelniederdeutsch und heutiges Plattdeutsch im ehemaligen Dänischen Herzogtum Schleswig. Studien zur Beleuchtung des Sprachwechsels in Angeln und Mittelschleswig. Det Kgl. Danske Videnskabernes Selskab. ^ Hinrichsen, Manfred (1984). Die Entwicklung der Sprachverhältnisse im Landesteil Schleswig. Wachholtz. ^ Gero Rueter (10 September 2013). "Northern Germany spearheads energy transition". Deutsche Welle. Retrieved 21 August 2015. ^ Lisa Waselikowski (8 January 2015). "Highlight of the Month: The First German State Achieves 100% Renewable Energy". Worldwatch Institute. Retrieved 21 August 2015. ^ a b c d "Education in Schleswig-Holstein". State of Schleswig-Holstein. Archived from the original on 4 May 2011. Retrieved 14 April 2011. ^ a b c "Institutions of Higher Education in Schleswig-Holstein". State of Schleswig-Holstein. Archived from the original on 30 September 2011. Retrieved 14 April 2011. ^ a b "Responsibilities of the Government". State of Schleswig-Holstein. Archived from the original on 30 December 2010. Retrieved 14 April 2011. ^ a b c d e f g h "State Government". Retrieved 28 June 2017. Wikivoyage has a travel guide for Schleswig-Holstein. Chisholm, Hugh, ed. (1911). "Schleswig-Holstein" . Encyclopædia Britannica (11th ed.). Cambridge University Press. This page was last edited on 13 April 2019, at 10:17 (UTC).